Had a jolly holiday season this year spending the Sunday before Christmas going on a straight 18-hour clay molding/sculpting spree. You know I’m desperate when I throw myself that deep into my crafts. Rather than blowing a gaping hole in my nonexistent debt-swallowed wallet on a pair of designer heels or some expensive jewelery for my girlfriend, I instead decided to use my hands and a few mounds of clay to fashion a homemade Christmas present. 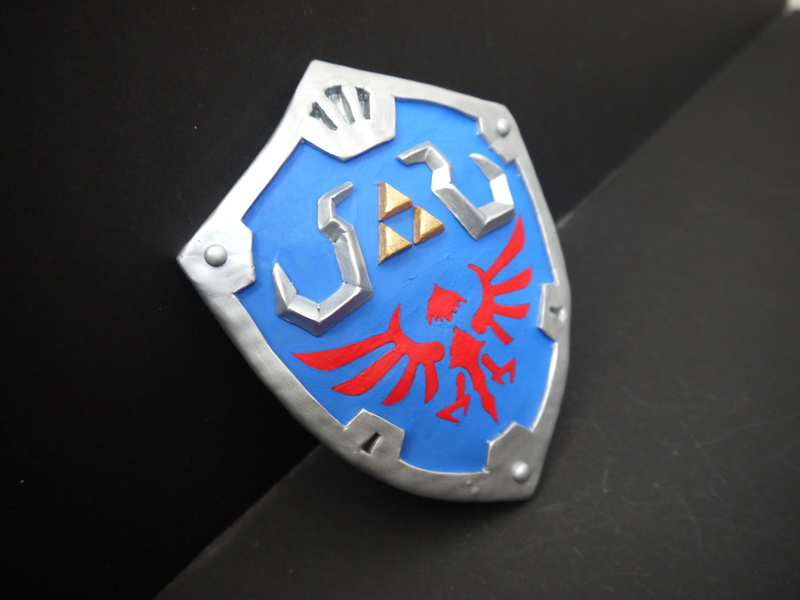 My girlfriend is a bit of a gamer girl and thankfully, a fan of the Zelda series as I am. She had recently played through Wind Waker earlier this year, and given her initial reaction of, “HE’S SO CUTE” to Toon Link’s appearance in said game, I figured it’d make sense to try my hand at bringing our Hero of Winds to life. My degree of success can be heavily debated and slandered by critics. The entire process has been documented from the very beginning to the horrific end for your viewing pleasure. My usual weapon of choice when sculpting big ‘ol professional things. A giant gray mound of Super Sculpey. I’ve since started using colored clays more than simply making everything out of this recently, since that saves on painting. The general color palette of this sculpt. Two-tone green, though not exactly the correct shades. Link’s main tunic is more of a neutral green, while his sleeves are a lighter, almost lime color, but I only had moss green and dark forest green. Decided to just roll with it. This is a rather handy little machine that rolls clay into flat sheets. It’s since become an invaluable part of the molding process for me ever since I acquired it; no more pounding clay into uneven sheets with a hammer with this baby. Best part is that the thickness of the sheets you wanna roll out can be adjusted, from paper-thin to fairly thick. Therefore I went ahead and scrounged up the hat pin set I used in the Toad Kart sculpt to make the kart axles to use as joint pegs to keep some pieces together. I cut the metal into short pegs to hold areas like the wrist, legs, and Master Sword together. Other, larger areas (like the head) saw the use of toothpicks as pegs. Legs were easy, but the torso was a little more difficult than I thought. Especially the chest area where a bit of his undershirt was to be shown. Got the arms and legs together with the torso. Ended up just cutting a triangle into the mound that was the upper chest and filled it in with appropriately sized pieces to make his neck and undershirt. It doesn’t look particularly smooth or natural, but it gets the job done. The belt was a bit tricky in that I had to create a perfect flat yellow circle, which is harder than it sounds. When creating circles (and perfect balls), I usually look for a stencil of sorts, something to punch the shape out. I had little success finding anything at first – I usually use a bottle of Krazy Glue, but that was too large this time ’round. Upon looking around my room for some inspiration, I found it – my mechanical pencil! Just had to pop the eraser off and take the top section apart and voila, instant perfect-sized hole puncher. It worked. I punched the little piece out by sticking a lead piece into the tube the opposite end. It’s good to be resourceful. The head. The hair. Oh my god, kill me now. I quite legitimately spent a good hour sitting at my desk fondling a mound of yellow clay trying to figure out how to do the hair. And I still couldn’t figure it out. A friend of mine suggested using a credit card to mold some hair lines, so I fished out my Barnes and Noble Member Card to do the trick. Didn’t turn out too bad, that technique. Hands. I hate sculpting hands, as I’m fairly certain I pointed out in the Toad Kart post. They look passable with the palms up, but from the back they’re totally flat, which was highly unnatural. Sadly I lack the skill to fix such an error. Mirror Shield in progress. Not too difficult, surprisingly. It was actually quite enjoyable sculpting this, but I suppose I’ve gotten used to making clay shields at this point. A good example of what I pointed out earlier, with the Krazy Glue bottle stencil. The circular grooves in the upper part of the shield were made using the bottle cap shown. Had a little trouble sculpting the mirror part of the Mirror Shield, so I printed out an image of it at an appropriate size, cut it out, and molded it based on that. Result? Flawless shield, perfectly proportional. Kind of like tracing. Left with basically two mirror shields of the same thickness. Double equip link? Make it into a phone charm? 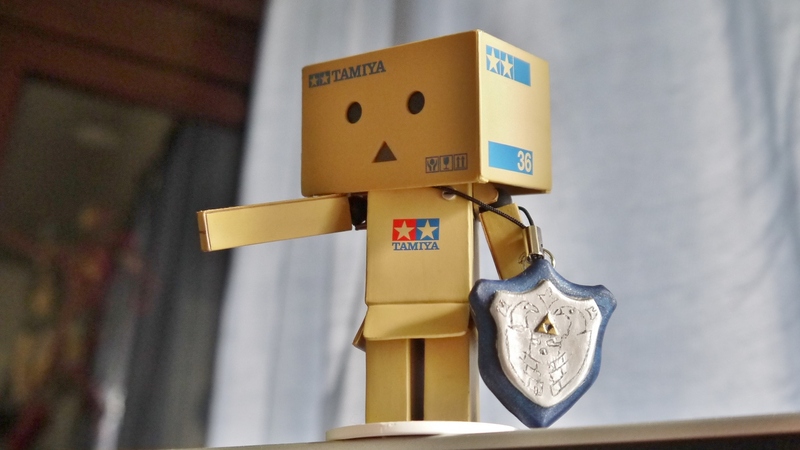 Give it to my Mini-Danboard? Just to give an idea of how tiny the shield was. Just a little over an inch tall. The microscopic Triforce was sculpted out of that tiny sheet of gray you see there. Moving onto the Master Sword. Not so awesome to sculpt. The tiny thing is rather intricate, and I had a difficult time keeping every little piece together. (See: the hilt and handle alone is made up of seven different parts). A part of the hat pin shown above was used to keep the entire thing together. Now I’ll confess – I had originally intended to sculpt Link in a pose where the sword would be sheathed, negating the need to sculpt a blade for it. 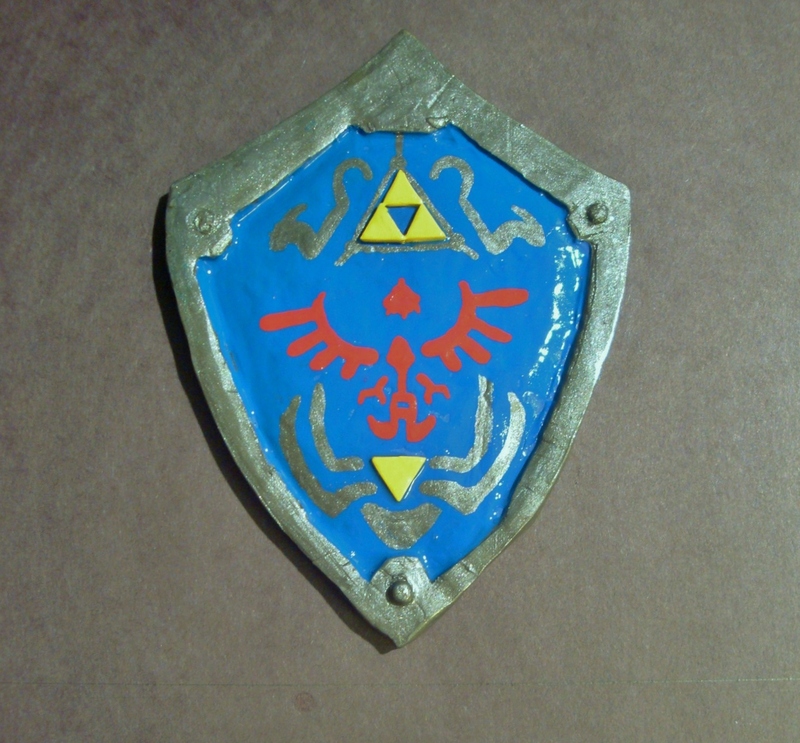 But then I decided that would be kind of waste, anything short of having the sword and shield drawn would just be lame. What I did was make a basic shape for the blade at first out of gray Super Sculpey, as shown above, and then proceed to sand it down into more of the Master Sword’s sophisticated blade shape after it’s been hardened. How it’s looking thus far; all of the clay is still soft, not yet hardened. Naturally some painting will be needed after it’s baked. The yellow stick next to the head is the scabbard. Had some problems with the original hands upon test attaching them to the wrists. Too large. He looked like he had overgrown hulkling hands. So I had to make entirely new ones. The original ones looked too square-ish anyways. Giant mound of black clay that will be run through the clay torture machine of death and pressed with the cup shown above to make the statue’s base. The usual procedure with most of my sculpts that have bases. Putting him together – he can stand! Somewhat. Still needs some back support. Still not baked. 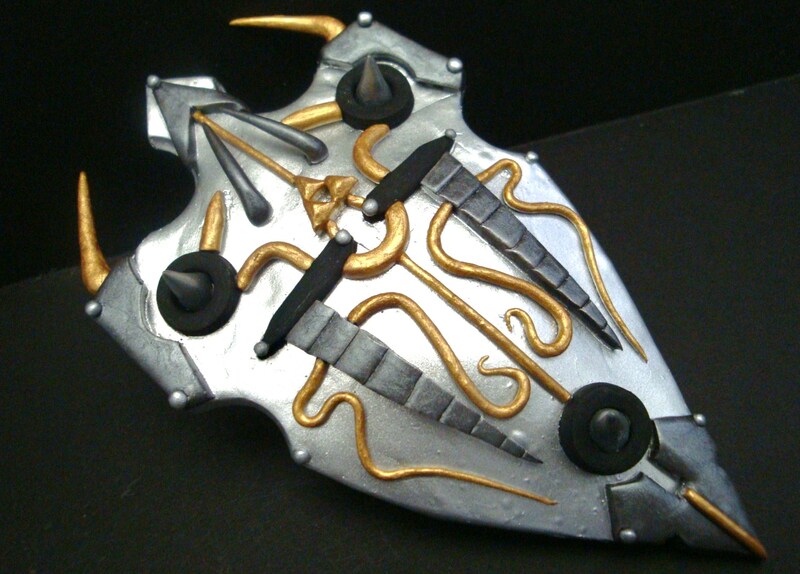 Generally all the pieces shown above can be held together on their own, with the weapons glued on after baking. All on the pan and ready to fry. Everything that’s separate will be glued together afterwards. But only half the battle is won – there’s still a lot of painting to do once it’s all hardened. All toughed up and painted some. Silver for the shield and handle, a coat of flesh tone for the face, hands, and ears, and white for the upper legs. I actually goofed on the baking – left it in for too long and some parts got messed up. Namely, the accursed air bubbles started forming on the base, a part of the lower tunic, and lots on the cap. When it gets too hot, this happens, due to air being trapped in the clay in some areas. Makes sense for the cap, which got damaged the most, due to it being hollow inside. I couldn’t really do much for the tunic and base, and those pieces didn’t even bother me that much. The cap though – I had to shave off the air bubbles and re-apply some clay to fill in the gaps. Upon doing so, the pre-baked clay is lighter than the baked clay (shown above), and I couldn’t throw the entire thing back in the oven to bake lest to already baked parts start to burn. So I took the entire thing to the bathroom, plugged in the hair dryer, and proceeded to set it to high. It worked – the newly added pieces hardened, but they didn’t change to a darker shade for whatever reason. Had to paint the entire thing with a thin coat of dark green to make the color match up. Another reason I hated the head with such a livid passion. It actually probably took me two hours to get the face right. And by the time I was done it wasn’t even really right. I just couldn’t figure out what it was about the original Toon Link face that made him look so cute. A huge epiphany I had halfway through was that the eyes don’t have outlines underneath – something that helped greatly when I had been outlining the eyes in black paint over and over again. Master Sword, after being sanded down and thrown with some silver. It was originally a flat sheet but note how the sides are slanted now to look like an actual blade. Finally got it to an acceptable place. Used a toothpick to attach the head to the body, everything is primed and ready. The face still looks off, but I was just about done with it. The Mirror Shield’s intricate designs are scribbled on with Sharpie, and it actually wasn’t that particularly difficult to accomplish. I cheated a bit and left out some of the original design for sake of space though. Last part to do after it was all put together – the sheath. As seen above, it got a bit charred in the oven. I dreaded doing this given how intricate the scabbard actually was, and how there were barely any reference pictures to draw from. Seriously, that proved to be the biggest obstacle – I didn’t know what it was supposed to look like. 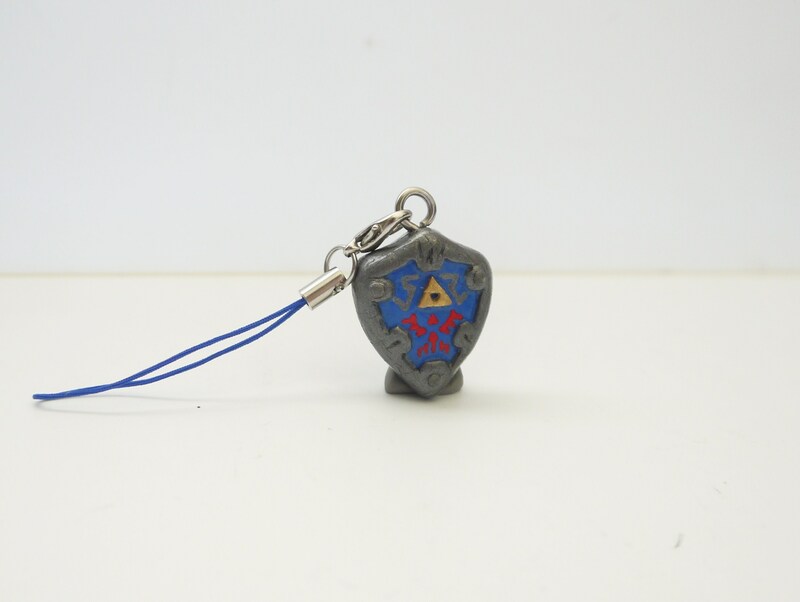 This was quite legitimately the only decent picture of the scabbard I could find online, from the Zelda wiki. I wasn’t far enough in my new Wind Waker HD to turn it on and check the gameplay for reference (my girlfriend has my Gamecube with my original save data) so this is all I could work with. Had to blow it up to like 500% its original size to work off of it. After a long and arduous journey, he is complete. Seriously, I sat down at like 10AM on a Sunday morning to start working on this, and only managed to finish at roughly 3AM the next day. That’s legitimately 18 hours of sitting at my desk workin’ this thing, with only food and bathroom breaks. Good job, self. I held in there. A bit of a turntable look at him. It honestly turned out so much better in my head, I’m so sad. The head is what bothers me most. Generally the proportions make him more like classic Link than Toon Link. I’m not particularly fond of the extremely non-dynamic pose I went with either. He only looks good at a certain angle, really. The hair is a bit too raised, so only an overhead view does it any semblance of justice. Made some custom packaging for it too, given it is a Christmas gift after all. I’m becoming more adept at shaping foam and cutting it apart. This is actually the most fool-proof way to pack such delicate items – anything short would result in untimely breakages. I’m not exactly pleased with the results. I feel like I could’ve done better, but I doubt by much. It wasn’t exactly a rush job either – I didn’t work on this project at a particularly hasty pace, despite completing it in under a day. I probably just need to spend some more time refining my skills at clay…I make more objects than people, I think. Just had a difficult time capturing the feel of the character this time, though I think I’ve done it pretty well before with some of my previous works. Either way, it worked as a Christmas present…I think. She called it “so ugly it’s cute,” so I guess that can count as a psuedo-victory. Kind of like getting kicked in the balls while being handed a fortune. With any luck future works will be improved upon; only time will tell. Well I think it’s a lovely gift to make for someone. Wasting all of those hours on something… it is more valuable than going to the shop and just buying her the first pair of earrings you see and I am sure she values that. It does look cute, don’t fret over it.